After years of neglect, getting this basement decluttered and organized was a top priority. We’ve talked about this many times before, but organizing always starts with a ruthless decluttering. Get rid of everything that you do not need, use, or want, or relocate those items that belong elsewhere. This helps clear the way for a good deep cleaning. A messy space is always harder to clean than an organized space but once this space was finally emptied out it gave room to move forward by giving the porcelain tile flooring good cleaning. Cleaning Choice For These Floors? Apart from the fact that a steam sanitizer can kill bacteria and dust mites, it also ensures a chemical free clean, removing any concerns about potential health problems which could be caused by chemical gases and residues in traditional cleaning products. Steam cleaning requires no detergents or chemicals for the ultimate in safety for all the family including your pets. Steam cleaners are fantastic to clean porous tiles, smooth tiles and the are the best way to clean grout lines. These surfaces are usually hard to clean because of their crevices and pores, but hot steam flows deep into every nook and cranny to effectively loosen dirt, grime and grease. After doing some research on line, we found the US Steam Falcon Commercial Steam Cleaner at our local Home Depot Store and rented it out for the day to complete this project. Before we started with the cleaning process, we gave basement floor a good vacuuming. Following the user manual provided, we connected the hose to the steam cleaner. Opened the safety cap and filled the talk with water using the bottle and funnel provided then replaced the fill cap. We then plugged in the steam cleaner and pressed both the Power and Steam Release Buttons on the “On” position. The Green Steam Ready Light started flashing while the unit was warming up. After about 15 minutes the green light went solid letting us know the steamer was ready for use. shoot excess water from the hose into a towel for about 10-15 seconds. Waited until green light came on again before starting to clean. This unit was great because it had a STEAM CONTROL DIAL to control the amount of steam released. By turning the dial counterclockwise, the steam would increase. To reduce amount of steam used we just had to turn dial clockwise. 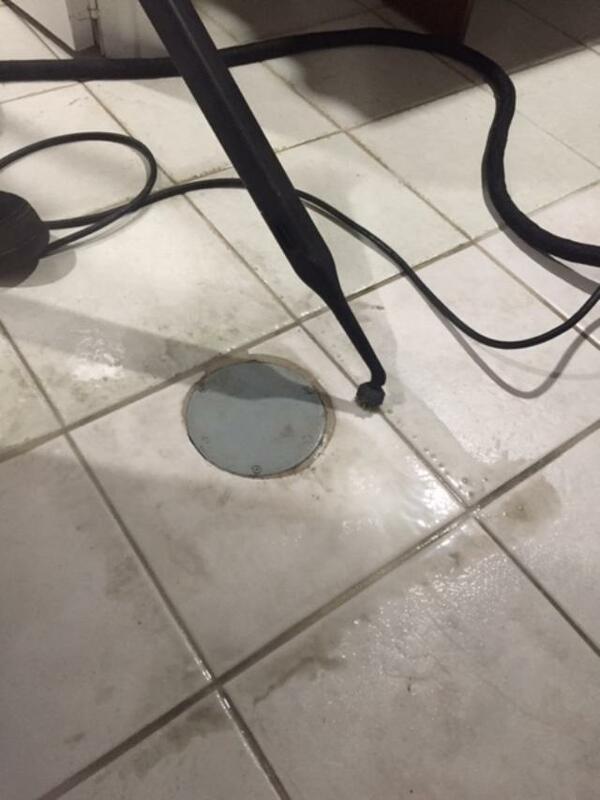 We selected and attached the 1 Inch Brass Brush to clean the grout lines and the 3-Inch Round Nylon Brush clean the top of the tile. GOOD TO KNOW: Keep away from steam cleaning too close to baseboards as they can get damaged in the process. It was surprising to see how much dirt and grime (the kind you don’t see) that was coming off the tiles and out of the grout as shown in the “before and after” photos provided. We filled many buckets over the cleaning process with clean warm water and mopped up the dirty and grimy residue left behind from the steaming process. We also used it in cleaning around the toilet. 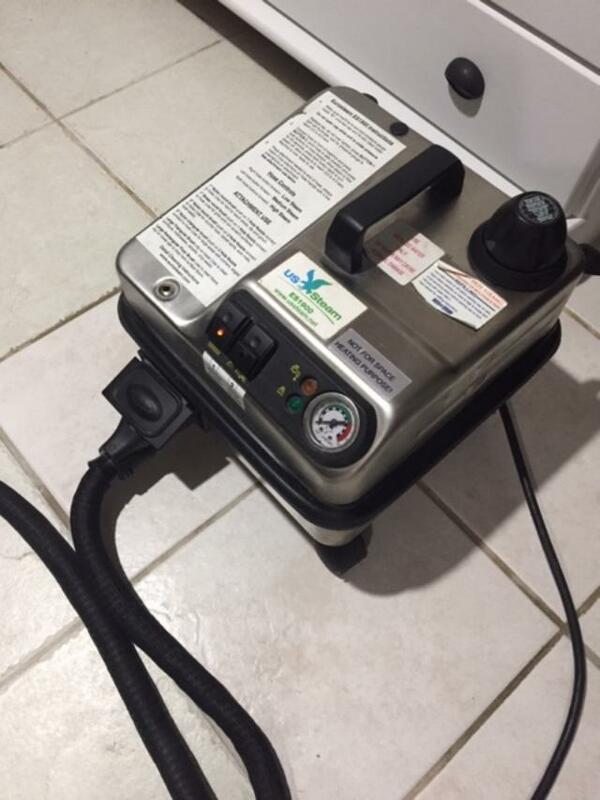 The US Steam Falcon Commercial Steam Cleaner is a great machine and uses no chemicals with it. It kills bacteria, eliminates odors and is Eco-friendly and did a great job on for this porcelain tile floor cleaning application. We will definitely be using it again in the future and recommend this product as a “chemical free” alternative to our friends, family and clients.